Sofscape Rubber Pavers are a unique Rubber Flooring Safety Surface that is Ideal for use in Preschool Playground areas, Daycare Facilities, and many other School Playground Safety applications in place of Wood chips, Rubber Mulch, Sand or Pea Gravel. Sofscape Pavers are approved for use in all Head Start Program Facilities, YMCA’s and Miracle League Baseball Fields and comply with the Americans with Disabilities Act (ADA) for Playground Accessibility. Sofscape Rubber Pavers are also approved for use as Fitness Course Flooring, Sport Court Flooring, Gym Flooring, Jogging Track Surface, or virtually any Exercise or Recreation related surface. Sofscape Rubber Pavers have also been extensively used for, Barn Aisle Flooring, Equine Breeding Area flooring, Veterinary Lab Flooring and Stall Flooring for all breeds of horses including the American Quarter Horse, Arabian Horses and Thoroughbred Horses. These Rubber Pavers, also referred to as Rubber Tiles or Rubber Bricks, can also be used in Dairy applications to aid in the health and comfort of dairy cows. Sofscape Rubber Pavers create a Slip Resistant Flooring and a Cushioned Surface which reduces fatigue and slip-and-fall injuries making them an excellent choice for pool decking, walking trails and biking trails in parks. Due to the outstanding noise reduction properties of this Rubberized Flooring, Sofscape Rubber Pavers can also be used in manufacturing facilities under and around manufacturing equipment. Sofscape Rubber Pavers are an extremely durable anti-slip flooring surface that is virtually maintenance free and suitable for sidewalks, walkways, patios and decks around your Home & Garden landscaping. Some people have found these pavers very useful as Greenhouse Flooring due to their excellent drainage when installed over crushed rock screenings. Unlike Concrete Pavers or Asphalt, Sofscape Rubber Pavers are soft on the joints and very comfortable for walking, standing or playing and further create a non-slip surface. The manufacturing process employs Green Technology by utilizing 100% recycled rubber commonly created by Scrap Tire Recycling making Sofscape Rubber Pavers very Environmentally Friendly. The Crum Rubber is compression molded into a unique geometric hexagon shape that contributes to its ability to create nearly any shape necessary to conform to your personal needs. Sofscape Rubber Pavers, were originally invented and manufactured by Reifen Rubber Company in Manheim, Pennsylvania and are currently being manufactured by Sofscape Caribe in Vega Baja, Puerto Rico. Loma Vista Distributing, LLC is an authorized Sofscape Rubber Paver dealer & supplier located in Scottsdale, Arizona. 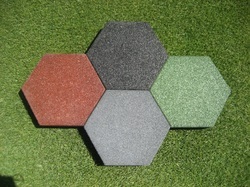 SofscapePavers.com is wholly owned and operated by Loma Vista Distributing, LLC.